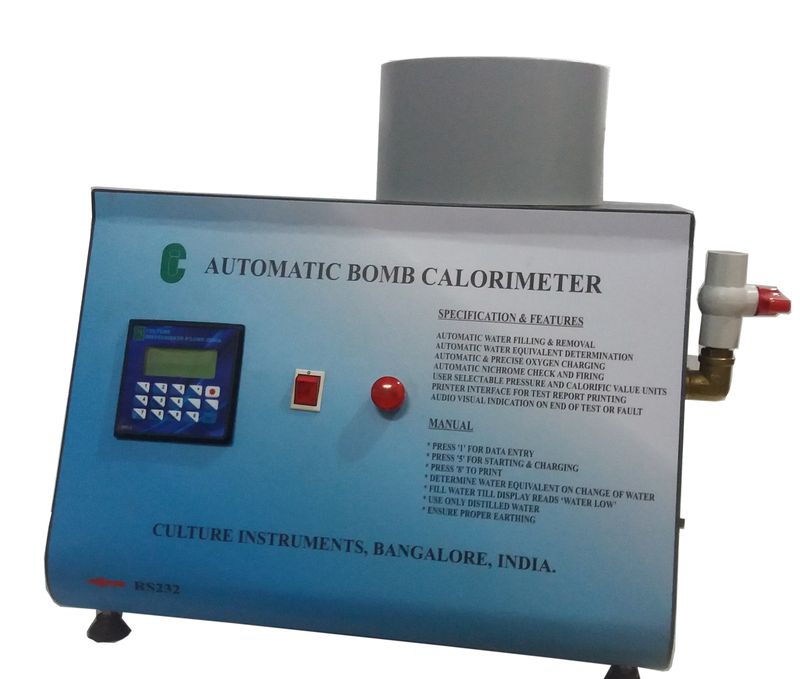 The “CI” Bomb Calorimeter can be used to measure the heat generated from several applications. The calorific value of the following groups of materials can be measured :- Building Materials, Coal, Coke, Fuels (gasoline, kerosene, diesel and gas (turbine fuels), Hydrocarbon fuel, Food supplements, Crops, Waste and refuse combustible materials, etc., USAGE UP TO 40000 CALORIFIC VALUES. * Weight data feeding through keypad. * Soft touch keypad with 15 keys. * Self explaining messages for ease of testing. * Automatic filling and removal of water from test container. * Automatic pressure charging. The user only connects a quick turn coupling to the test vessel and the oxygen is filled to the preset value. If, not an error message is displayed. * Automatic water equivalent determination and calorific value calculation. * Interface to printer via RS232 for report printing with company name (factory set), date, timing and other test details. * User settable temperature scanning interval for testing of samples with calorific value to very high calorific values. * Automatic monitoring of water level and alarm if water level is low or water temperature is high. * Ergonomically designed incorporating all the necessary systems occupying minimum table area. * Leak and maintenance free quick charging and discharging setup. * Reduced operating time and cost due to lesser number of operations and spares. * Inbuilt nichrome wire length measurement and cutting system.